Children's clothing There is 1 product. 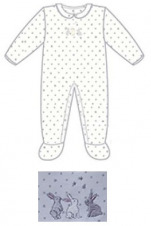 Sleepsuit printed velor fleece knit, ecru with small gray stars and 3 small print and rabbits. Closing by pressures legs so you can change your baby easily. Available size 3, 6, 12 and 18 months.